I write this because I want you to be aware of and outraged by the situation faced by many thousands of incarcerated people in this country today...in private, for-profit prisons that are about to challenge China's cheap labor force in the name of corporate greed. 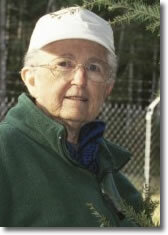 My dear friend, Sister Jackie Hudson, Dominican nun and Plowshares activist, passed away in August, and I am sad indeed. With her partner, Sue Ablao, she ran the Ground Zero Center for Nonviolent Action in Bremerton (organizing resistance and vigils regularly at the Trident nuclear submarine base at Bangor) and she was one of the nuns who went to federal prison for 2 1/2 years for a simple symbolic nuclear disarmament action in Colorado in 2002, which I wrote about in the song "Sisters of Sacred Earth and Space". Her friends figure she may have gotten the myeloma that ultimately killed her from the contaminated drinking water at the Victorville CA federal prison in which she served her time until 2005. The air force had been using nuclear materials there, and the prison was built over the old air force site. The women were warned not to bathe in the water if they had open sores, but they all drank it. Then they built the new men's federal prison bucket by bucket of concrete and sand, for 15 cents an hour. Fortunately, Jackie, then only 70, was given an office job for 10 cents an hour. Jackie was sent home to Washington State, hospitalized, and stabilized as much as could be. But there were too many things wrong. After one bout of chemo, Jackie's partner Sue said Jackie's little body just couldn't take the multiple complications. She passed quietly, attended at all times by friends, on August 7th. Sitting in the backyard of G.Z. Center,I wrote "Jackie's Waltz" and played it there during the 2011l Hiroshima and Nagasaki memorial actions. I played it for her service there a few weeks later, too. It was for her I wrote "Love Will Lead Me Over", a song loved in the peace community here. The writing and the singing help me deal with grief, and like Jackie, I do not fear death. At the memorial, we sang with gusto. You an see it on YouTube if you look for it. Congressman Dennis Kucinich was with us on Hiroshima/Nagasaki Day, and his beautiful fiery heartfelt words about the need for disarmament and the intense foolhardiness of this country's behavior in the world would have cheered Jackie's heart. His words about the prison system echoed what I have said above. The ridiculous trumped-up debt ceiling debacle, all of it...lies and deceit. So many issues...we need to take this struggle to the streets, he says, and I agree. Occupy has begun that. We are all connected. It isn't just that nobody's listening to us when we say "NO" to more wars, more nuclear weapons, and more nuclear plants, and no to tar sands pipelines, trillions to support illegal occupations and unwanted new bases globally and Theatre Missile Offense systems, and a bloated military and Pentagon budget, and corporate greed that cripples and impoverishes the 'middle class'. We aren't heard when we say NO to private prisons and their abuses, nor those of the working people in the US, and the unions that helped us get a weekend. It's that the powers that be don't seem to care. Not at all. This planet is our only home. We have no other. Over millennia it has intelligently supported life, in whatever state life has been. It's our little spaceship home. We are all related, too. It's our family at stake, our sanity and our souls, too. If you haven't started yet, I ask you to act. Speak up, speak out, tell friends, pick your work, and go to it. We can't opt out nor can we cop out. We all have known that these hard days would come...they are here. Globally, it all appears to be up for sale to the most dire criminal elements: Everything we value. Everything we need for decent living on a dear, abundant planet that is now so stressed - water, air, land, oceans, life in all its forms, the sacred and the mundane, the dearest of all things, the right to live in peace. Earth will win, I know. It's a strong planet. And whether or not we humans make it might be for you (and for me, often) a moot point, we are here and we have children and we love them and (mostly) we love each other. So we are it. Pick something that needs to be done and do it. You will never be without friends if the work is true and justice is the result. I wanted to say this to you, in Jackie's honor, and because I have been hearing her in my heart. One more step, and then another. Piecing the puzzle together, peace by peace, one day we could prevail. I started talking about the private prison system, and I ended with the Big Picture. Ah, well, it's the Aquarian way. Thanks for reading this. Thanks for whatever you do to help.